Nearly ten years ago, I could’ve predicted San Francisco would have its finger on the pulse of future music. Burning Man, which was born in the City by the Bay, provided the first clues. Black Rock City, Nevada (the temporary community that springs up during the event) was already twenty thousand strong at that point, but I was lucky enough to stumble upon SF’s then best kept secret, an uber-talented up and comer known these days as Bassnectar. It’s difficult to imagine my life prior to that night. In addition to the above-mentioned underground mastermind, San Francisco has since produced a small army of noteworthy get-down pilots including Beats Antique, An-ten-nae, Marty Party and members of Glitch Mob. Just as “Let It Be” organist Billy Preston is often referred to as the fifth Beatle, Ana Sia was once considered the fifth Mobster (Kraddy recently left the one-time foursome to fly solo). 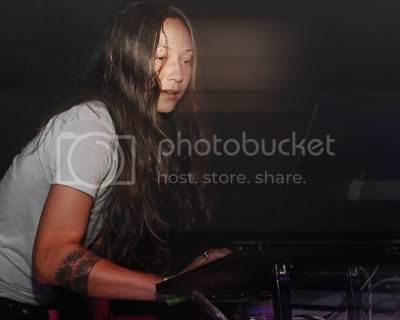 Her Gothic Theatre set Saturday night, alongside Mark Farina and DJ Colette, was slamming as usual. DJs that don’t dance to their own music should be suspect IMO. It’s the same “Do as I say, not as I do,” attitude that smoking parents often wield. Talk about setting a pathetic example. Ana will never have that problem. She was a dancer long before being a dance-floor choreographer, and has never been shy about multi-tasking. Animation at the helm has always been a big selling point for Bassnectar as well (I believe his Cousin Itt mass of hair is slightly longer than hers though). “Omni-tempo” is another. Whoever said dance music sets were required to maintain a single, uniform BPM should be shot. Or at least poked really hard. Variety is paramount. And Ana is on it.